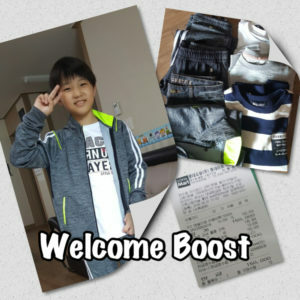 Through the Welcome Boost Program, which we launched earlier this year, KKOOM provided funding to buy new clothes for a 10-year-old boy at an orphanage in Korea. The fourth grader, J.W., came to the orphanage after his father was reported for child abuse. J.W. arrived with only the clothes he was wearing. The orphanage bought J.W. a couple of outfits, but obviously he needed more to wear to school. KKOOM gave J.W.’s house mother at the orphanage 150,000 won (approx. $135 USD) to purchase clothes for him. They went to the store together and picked out several new outfits, as shown in the picture. J.W.’s house mother sent us the pictures you see, along with the receipt for the purchase. This is a process we follow for all of our programs in Korea so that we can ensure accountability for how donations are used. It looks like J.W. was pleased with his new clothes. J.W.’s house mother says that he is a good student, getting top marks at school. She hopes that he can get used to life at Samsungwon and continue his academic success. She also sincerely thanks KKOOM supporters for providing the funding to help J.W.’s adjustment a little easier.